Dampier Strait liveaboards visit this stretch of water that sits between two of the larger of the Raja Ampat islands, Waigeo and Batanta. The strait is named after the British navigator William Dampier who charted much of the region around the Raja Ampat islands and Papua during the 17th century. The region was subject to a fair amount of military activity during the Second World War. The allied planes even bombed one of the small islets in the strait. From the air the phenomenal currents were mistaken for a submarine wake and a completely uninhabited island was heavily bombed. The underwater topography and the fact that it is between two larger islands means that the currents are very strong. The currents bring plankton rich waters up from the deep which attracts a huge number of fish and bigger pelagics to the strait. 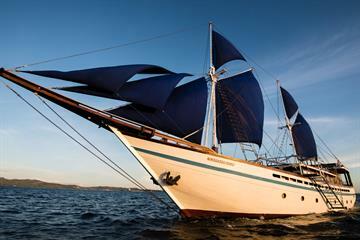 A good selection of liveaboards visit Dampier Strait as part of a Raja Ampat dive itinerary. The position that the Dampier Strait is in means that the currents are plankton rich and full of fish life. The reefs are excellent because like the rest of the Raja Ampat islands the Dampier Strait is inside of the coral triangle. The dive sites are normally caked with corals full of critters and beautiful reef fish. Dampier also enjoys particularly good conditions for divers to see some bigger animals. Mantas are frequently seen here on liveaboard dive cruises, sometimes in large numbers. It is not unusual to see groups of them swimming in the current, mouths wide open feeding on plankton. They also come down close to the reefs which makes this a top photography and videography opportunity. Mantas aren’t the only bigger fish on offer here with white and black tipped reef sharks to be found sleeping on the reefs. During the day is a good time to look out for them hiding under rocks with their conspicuous tails sticking out. Wobbegong sharks can also be seen camouflaging themselves on the bottom, resting during the day. They are a fascinating shark and their strange bearded chins make a great macro shot. There are a number of excellent dive sites visited by liveaboards in the Dampier Strait, but for fish life none come close to Sardine Reef. Oddly there aren’t any sardines but there is no shortage of fish here to make up for it. This is the kind of place where you will be surrounded by amazing shoals of trevallies for the whole dive. Don’t let that distract you from the Wobbegong sharks that are lurking on the bottom though. Nearby, Cape Kri is also crowded with fish shoals and you can also see barracuda hanging about. 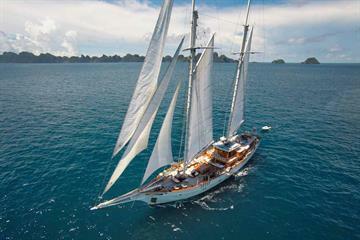 Many divers join liveaboards to Raja Ampat to see the mantas and Manta Sandy in the Dampier Strait is the place to catch them. The currents mean there is plenty of food for them here and it isn’t unusual for them to swim near to the sandy bottom. Photographers should have their cameras ready for a close-up. The conditions in the Dampier Strait mean that this is not really a good dive area for new divers. Heavy current on the dive sites can be very strong so a few extra lanyards would be a good idea. The entire region is quite isolated and there are not so many facilities, so make sure you bring ample spares with you. Reaching the Dampier Strait area requires some time and a few different modes of transport. The airport in Sorong in West Papua is the closest to the Raja Ampat islands. There are no international flights to this airport but you can get there from Jakarta and Singapore. There are some ferries from Sorong to the islands but most divers opt for a diving cruise. 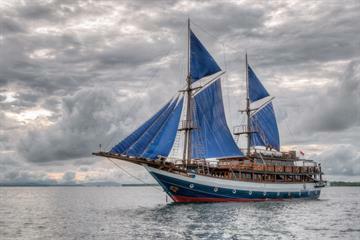 Indonesian liveaboards typically start in Sorong and take from a week to two weeks to visit the best dive sites in the region. 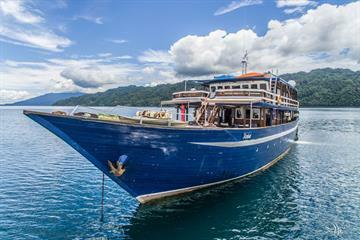 There are different kinds of diving liveaboards available to suit various styles and budgets. The conventional motor vessels customised as dive boats offer comfortable accommodation and a smooth diving experience. 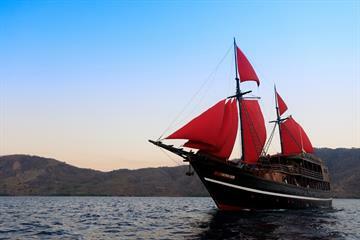 For a more unique experience many divers enjoy the traditional Indonesian sailing boats. 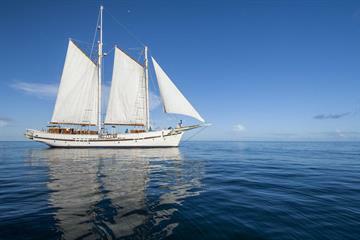 These beautiful vessels are a peaceful and traditional way to enjoy the islands.